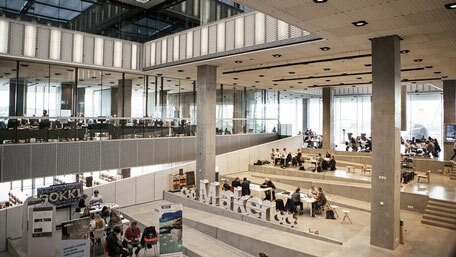 Denmark’s Dokk1 is helping to redefine the concept of ‘library’ as an urban, cultural, creative, community space. Denmark’s Dokk1 is helping to redefine the concept of ‘library’ as an urban, cultural, creative, community space that will serve as a benchmark for the ambition for libraries throughout the world. Alan Clark, an adviser to Designing Libraries, paid a visit. Here are his impressions of an impressive library space. Standing on a promontory close to the centre of Aarhus, where the river debouches into Aarhus Harbour basin, Dokk1 is at the centre of the Urban Mediaspace project which is redeveloping the waterfront of the city and is ideally placed for its role as a cultural and informational hub for the city and the Central Denmark region. It also has a striking physical presence and is probably already achieving one of its aims of becoming an icon for Aarhus. The architects’ conception of the building connecting with its surroundings and which would be looked at, seen into and looked out from is triumphantly achieved. The new light railway opening in 2017, which will have a station on level 0 of the building, will further improve Dokk1’s position on Aarhus’s transport network and the building already incorporates a fully automatic car park for 1000 cars. The latter was financed by a large private donation. Externally there is lift and escalator access from level 0, light railway, car park access, cycle park and pedestrian access and also four sweeping sets of stairs to the balcony to Level 1, the first of three service floors. This balcony, which encircles the building and is protected by the cantilevered roof plate, provides a large external circulation and play space, the Globe, featuring as part of “a voyage of discovery” a seven metre bear for children to play on and slide down and other diversions. The roof has an array of 2432sq.m. solar panels. There is a seawater cooling system. Most of the lighting in the building uses LED. Level 1, the main entrance level, houses as you enter it the Aarhus Citizen Services, the city’s large main hub for its citizens’ informational and procedural needs and beyond this Tourist information and the Main Library. Level 2 is devoted to a wide range of provision and services aimed at the needs of families and children from birth to adulthood. Level 3 includes staff accommodation, the staff canteen and a range of private and commercial concerns lease space in the building. This last provision was apparently a response to austerity as a result of the Europe-wide economic downturn. Dokk1 is reputedly the largest library in Scandinavia, 28,000sq.m. over its three levels and it feels spacious without being overwhelming or confusing. This is the result of clear-headed thinking about a coherent arrangement of space, in the light of major patterns of use and traffic flows and judicious zoning of facilities. One feels that the variety of closed and open spaces, bookable and drop-in, the facilities which they each offer and the clarity with which the expected uses of those spaces is set out, provides for and respects diversity of need, without being overly prescriptive. Directional signing is good and information points at the entrance to each facility summarise (in Danish and English) its purpose and acceptable uses. These spaces include two halls (seating 75 and 250); meeting rooms, a teaching room; two project rooms for cooperative working; six study rooms; a room and fifteen open oases for relaxation and events. The Cafe has indoor and outdoor seating areas, including an adjacent Living Room for drinking your coffee, reading newspapers and magazines and relaxing. This is supplemented on Level 2 by an Eating Room and a room for nursing mothers, although babies can be nursed anywhere in Dokk1. In total there is seating for 1,100 of which 650 are in open areas. The accessible library stock comprised when I visited c. 220,000 books and c. 79,000 other media including of course access to a wide range of databases and online resources. 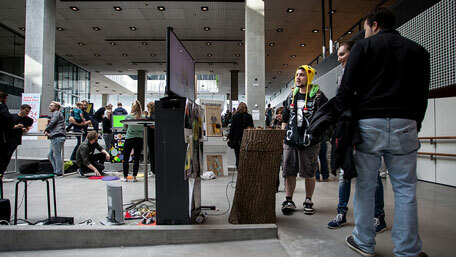 The Aarhus City Archive collections are also being added to Dokk1. There was some reduction in the number of print titles immediately available in the new building and I did hear a long-time user of the library complaining about this and about the time it took to retrieve items from store. Stock on the shelves is up-to-date and wide-ranging in subject matter, language and cultural background as befits a multi-cultural city like Aarhus with a thriving arts scene and many students. 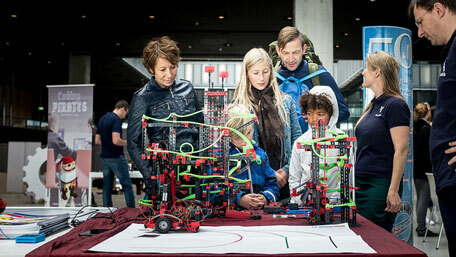 Linking the general collections and facilities of Level 1 and Level 2 with its emphasis on Families and Children in a most imaginative manner is the Ramp. This broad “staircase” has 5 levels, platforms which can accommodate a wide range of provisions and activities. On my visit these included skill based electronic games, a large scale chess set and a 3D printer. These levels can be cleared and the Ramp transformed into a raked auditorium seating c.200 and performance space with a stage area and suspended projection screen at its foot. As you reach Level 2 you are confronted by the beautiful Gong, a 7.5m long bronze tubular bell suspended from the roof, which can be rung, at the request of the parents to mark new births in the city’s hospitals. 1% of the construction’s total budget was earmarked for artistic decoration of the building. Dokk1 is very clear that Level 2 is for Families and Children. As on Level 1 there is the aim of providing a comprehensive range of facilities to respond both to broad types of need, whether related to age or background and to diverse individual needs and preferences. The Nursing Room and parking areas for buggies emphasize that children are welcome here from birth. The Children’s Lab is a creative space for 4-8 years and provides the means for playing with words, creating images, playing games or taking part in planned activities and open workshops. The Stage is a space for small events; readings, plays, music for children and families. The Family Lounge provides, quiet play, board games, reading aloud and “general family cosiness” with no distracting screens. Not that there is any shortage of screens in other areas; e.g. on the Gaming Street for children up to 12, and on the Balcony where you can plug in your computer or use your tablet and in numerous locations on Level 1. In the Attic generations are encouraged to interact, connecting children with their parents and grand-parents via toys, games and artefacts from previous generations. Finally there is provision of resources and services for the Tweens and the Teens, who seamlessly will also start using the general user facilities of the building. Dokk1 proclaims its vision as a flexible and dynamic sanctuary for everyone in search of knowledge, inspiration and personal development. Its core values start from the concept of the citizen and embrace lifelong learning, diversity and cooperation, broadening experience and cultural awareness and providing links between individuals, technology and knowledge. I would have to say that for me, Dokk1 in its building and the services it is providing looks to be pursuing that vision and those values with commitment and imagination. 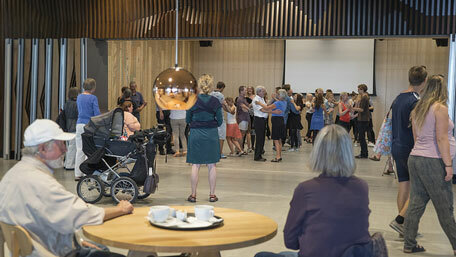 I visited Dokk1 the day after the building had celebrated the first anniversary of its opening; across its service levels people of all ages were making use of the facilities it provides. The people of Aarhus seem to have taken Dokk1 to their hearts. 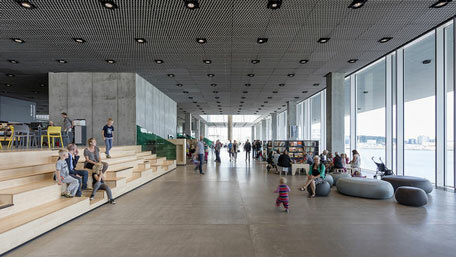 Schmidt Hammer Lassen Architects has completed a 30,000 square metre library and Urban Mediaspace, known as Dokk1, in Aarhus, Denmark. Dokk1 belongs to the elite of world libraries. You are in no doubt of this when you walk through the main entrance into the futuristic environment. The Danish Agency for Culture has published its model programme for public libraries, a toolkit for library design in the digital age that anyone can use. 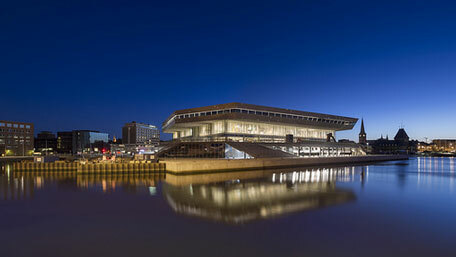 Dokk1 in Aarhus has been crowned the best public library in the world. News feature from Fortune magazine.